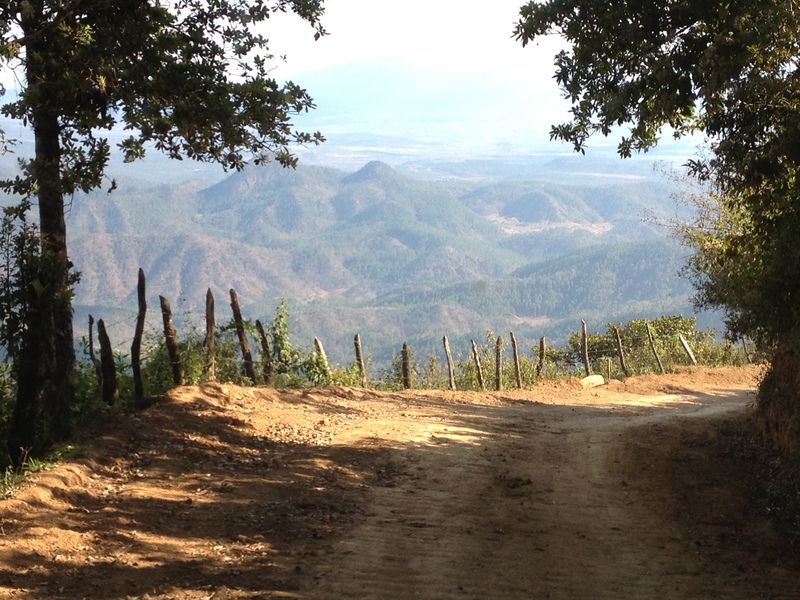 …or, How To Survive The Rough Roads Of Honduras. 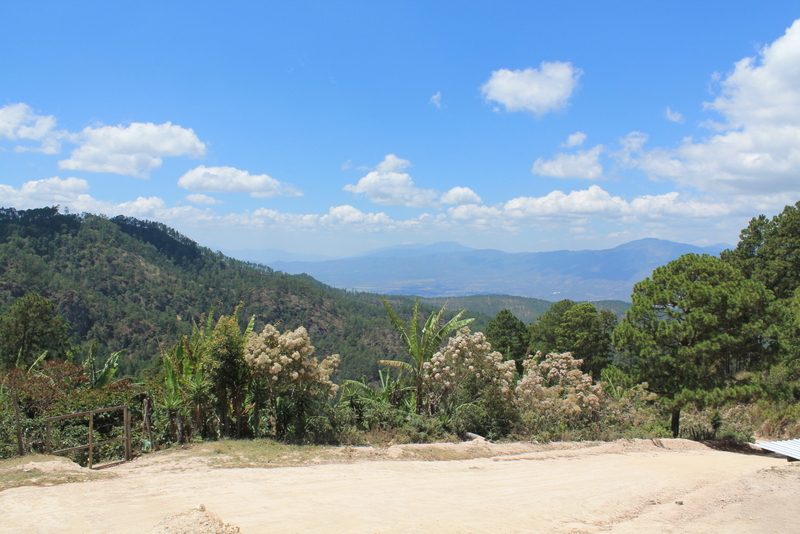 I think we’re still vibrating from the bone-rattling trip Saturday up into the mountains of this part of southeast Honduras. We were in a 4×4, but that doesn’t make the jostling any less, it just means you’ll make it to the top. You hope. 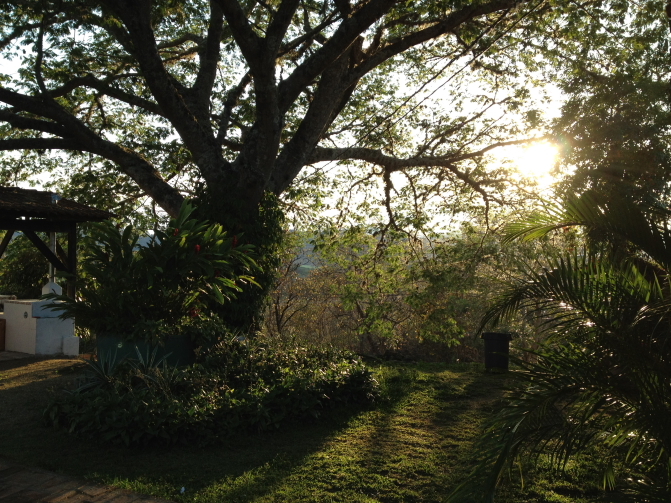 We’re just lucky it’s the dry season here. We woke Saturday morning with the plan to head out and up into some communities that are very difficult to access, either by vehicle, burro or on foot. After a hearty breakfast, we loaded into a Toyota Hilux pick-up truck, 4-wheel drive of course, and left the Rapaco compound, bound for an area that Global Brigades has implemented what they call their holistic model. This is where they put into practice all of the separate Brigade they run: Medical, Dental, Architecture, Water, MicroFinance and more. Go here to learn more about GB’s overall mission. 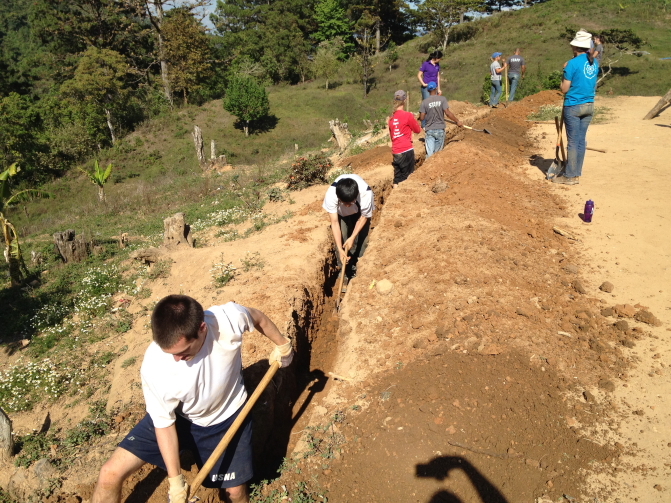 And so we started up. And up. And up. 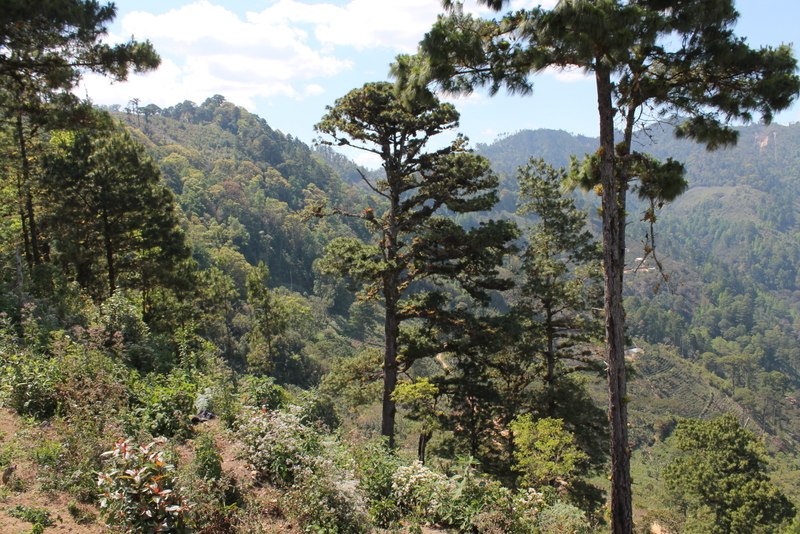 Though Honduras has a long Caribbean coastline, the interior is mostly highlands: wide valleys and mountains reaching in excess of 6,000 feet in elevation. And these mountains are steep, jagged and rugged. Driving up the rocky roads you may feel as if you’re in the Rockies of the Southwestern US for all the pine trees and blue skies and chest heaving elevation. 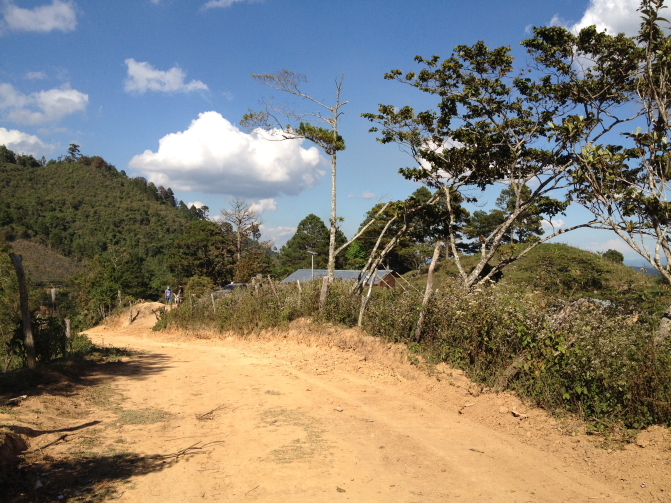 The first community we stopped in, after crossing two rivers (again thankfully it’s the dry season), was Zurzular. 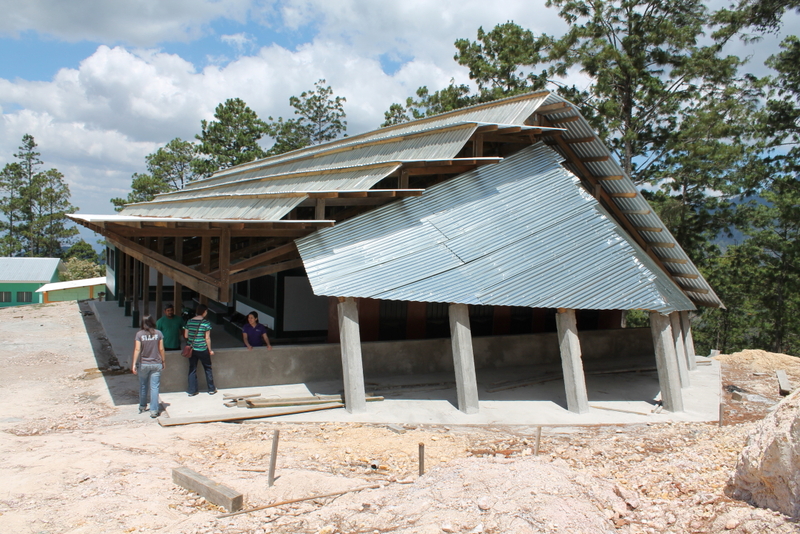 Here, Global Brigades operates a clinic and is just finishing construction on a pretty cool looking school designed by their Architecture Brigades. 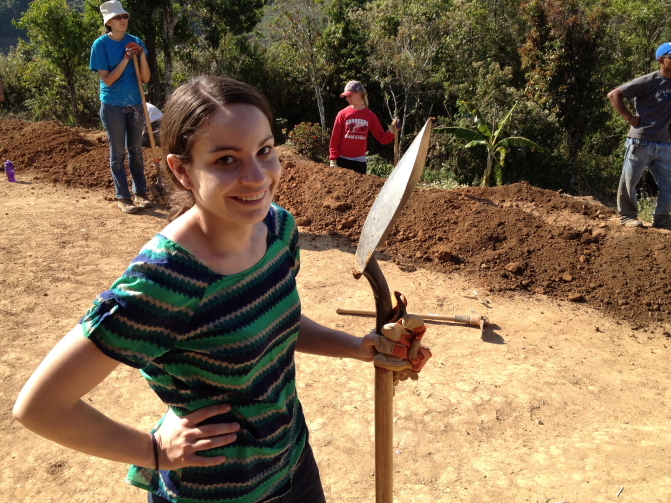 From there we went even higher up to the village of Palo Verde. 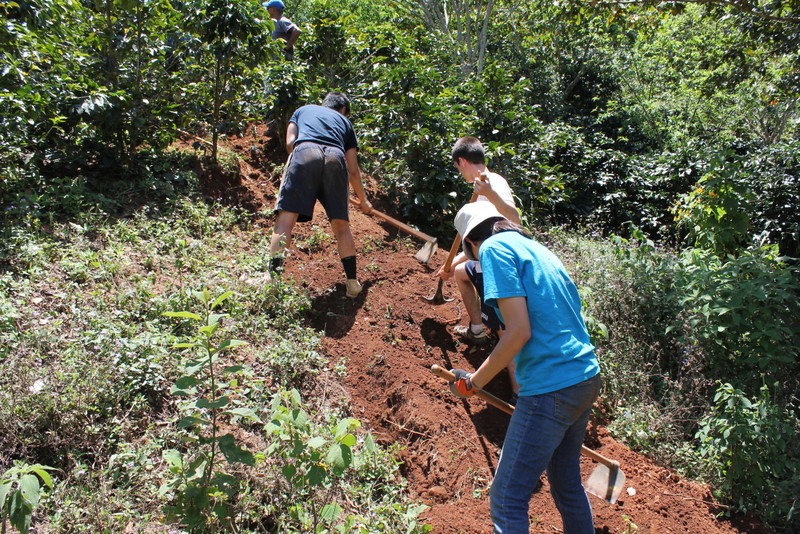 This is where we met up with a Water Brigade, college students from Northwestern University, busy digging a trench through a coffee plant plot perched on a steep mountainside. 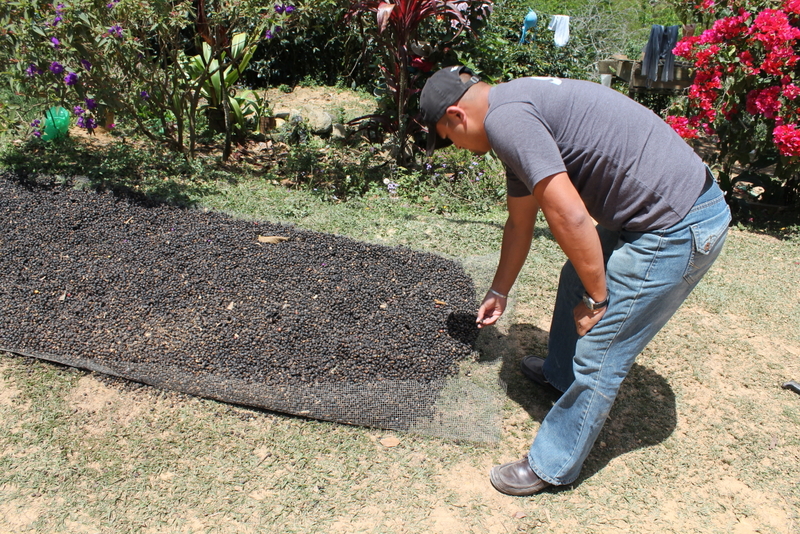 There are many acres of coffee plants in the higher elevations of these mountains. 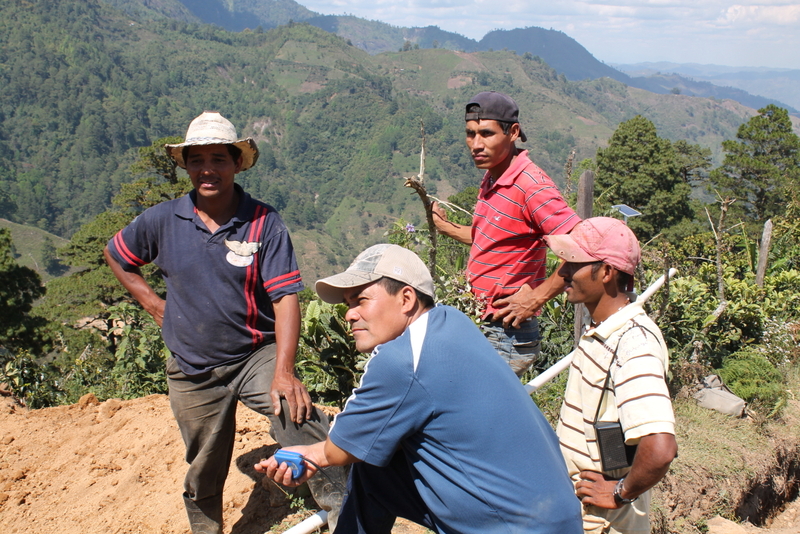 And most of the people living in these remote villages are way out here to cultivate and harvest the coffee bean. 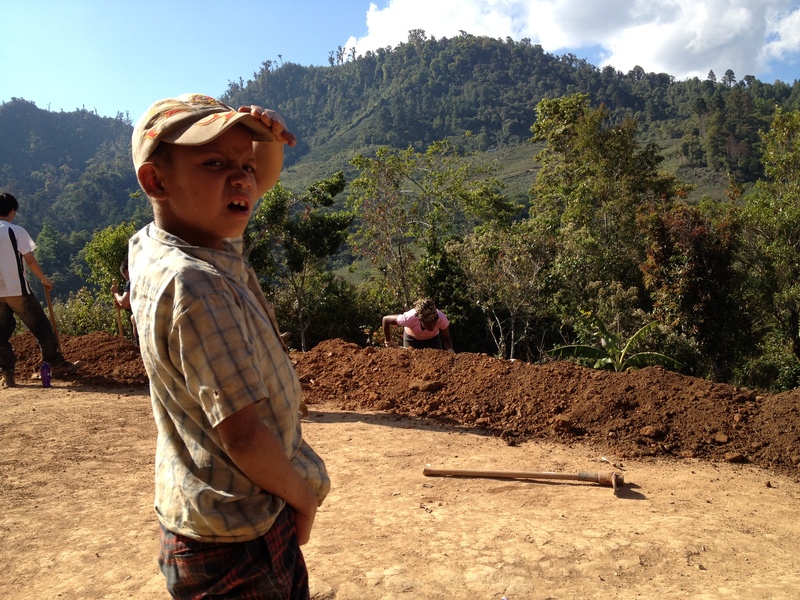 And due mostly to the remoteness, these villages don’t have, or haven’t had until GB’s efforts, access to clean water or adequate medical care. 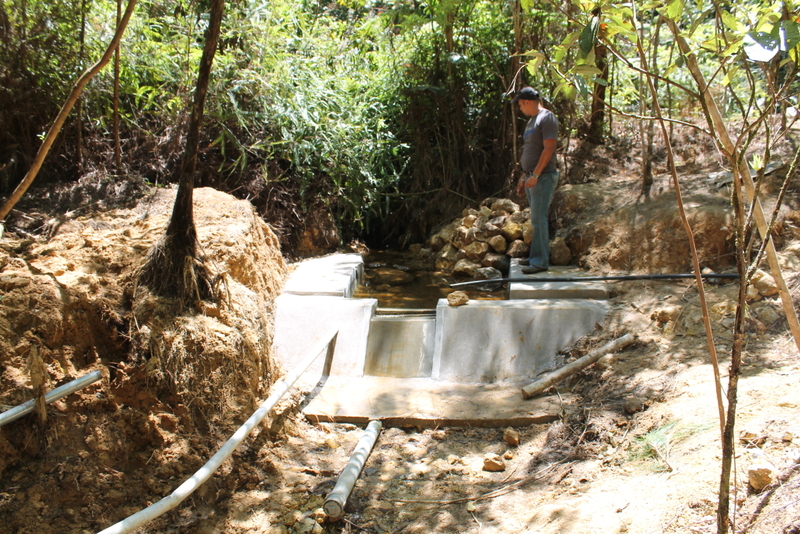 The Water Brigade we fell in with was busy laying 6 kilometers (3.6 miles) of PVC pipe from a natural spring and stream higher up in the mountains. 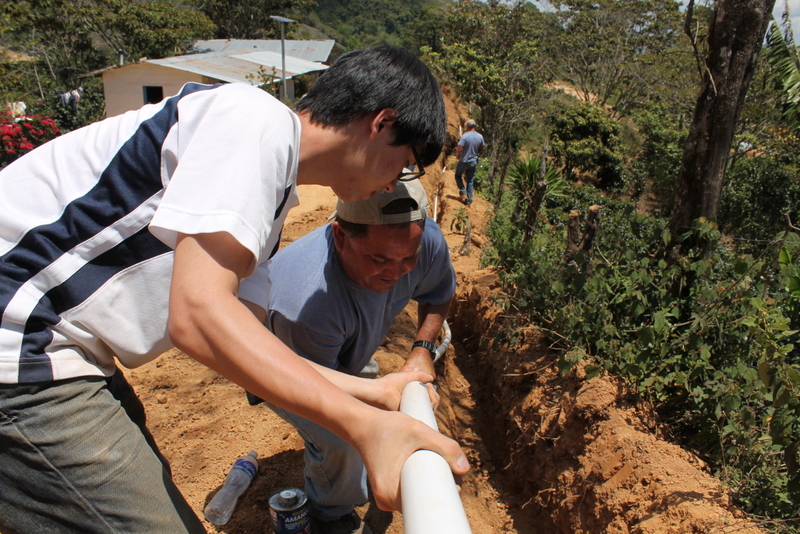 We hiked into the dense forest, down a steep slope, slick with mud, to see the source and how the water is collected and sent down the pipes to houses miles away. 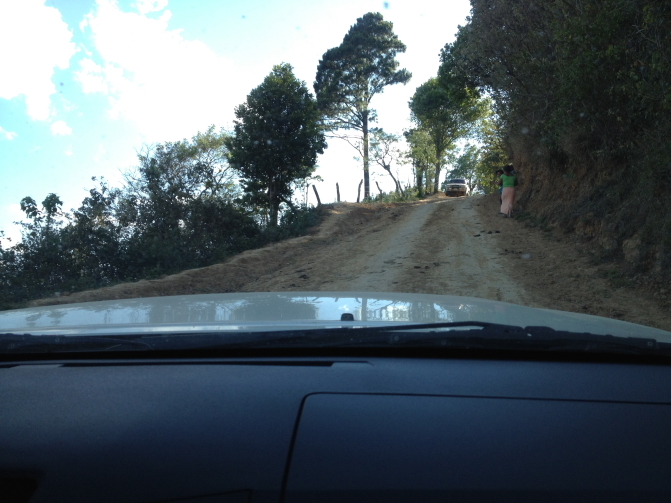 We made the thigh-burning climb to get back to our truck and then drove to the village of Bella Vista. 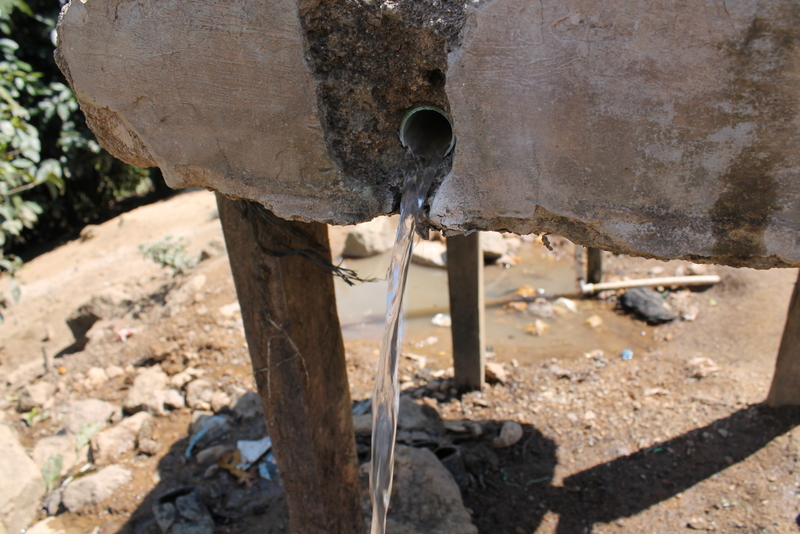 Here, houses are already connected to the system, and clean treated water now flows through their pipes. It’s not about convenience or luxury, but rather that first line of health defense. To cap off the day, we drove back down to Palo Verde and assisted the Water Brigade dig a 100 foot-long trench down to knee depth. 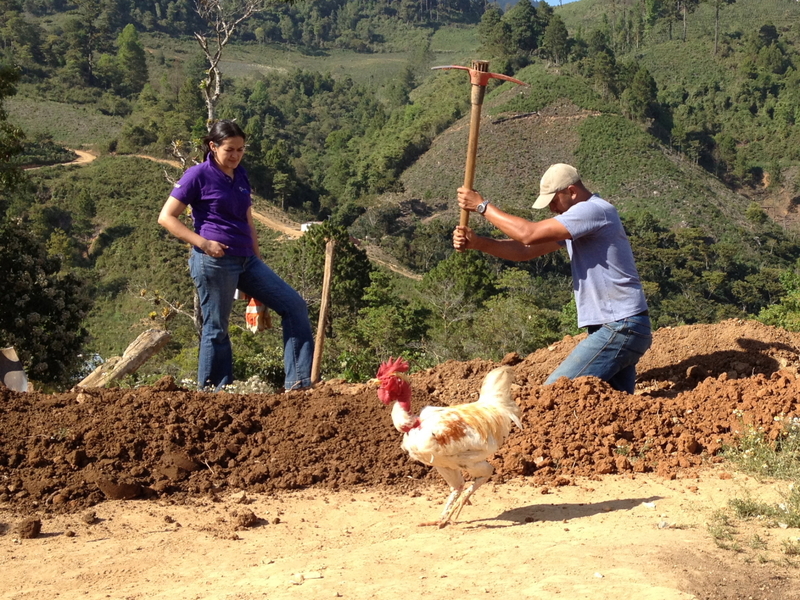 Good hard work, which the children and the chickens enjoyed watching. Now, our attention turns to the Medical Brigades that have begun to arrive from stateside, and the deployment of the Ready Relief Boxes. We have arrived! By we, I mean myself and Emma Spong, Heart to Heart’s very own Ready Relief Box Specialist. We arrived in Tegucigalpa, Honduras around one o’clock local time, following a seven hour journey beginning very early in Kansas City. 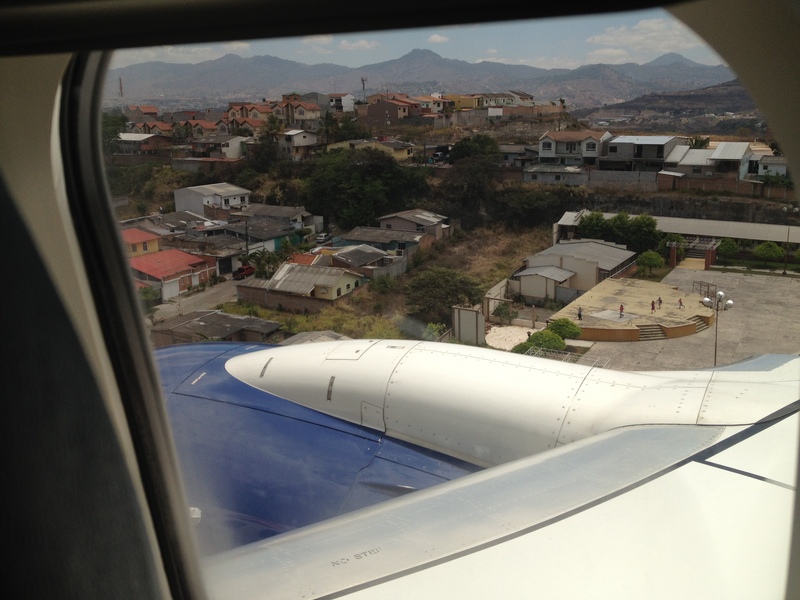 Now, if you haven’t heard, the Tegucigalpa airport is considered the second most dangerous airport on this globe. Reason being, planes must closely navigate the mountains surrounding the city and thread-the-needle to make a landing at Toncontin International Airport on the short runway in the middle of a busy city. There’s no room for error. Looking out the window with the ground just feet away, people and buildings and traffic all very close… quite the experience. Just look how close those children are in the photo. 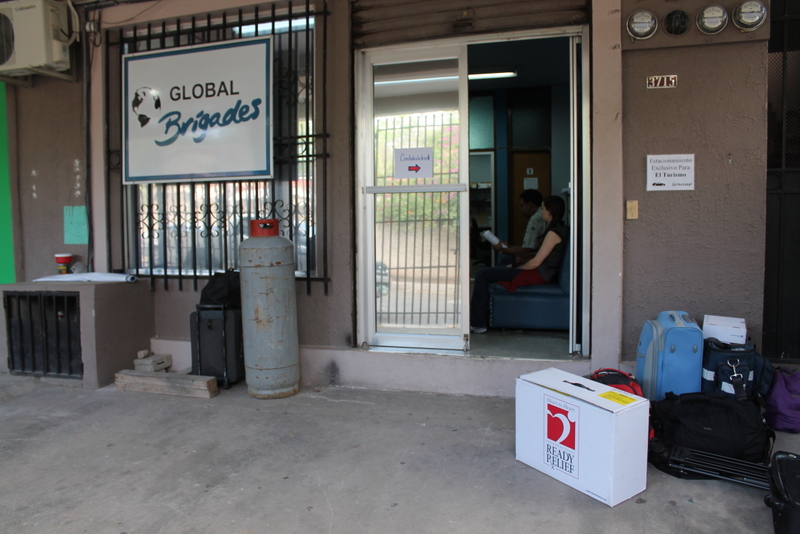 All went very well and representatives of Global Brigades took us to the group’s headquarters where we met the group’s Executive Director Quique Rodriguez, toured their facility, and learned a bit more about their operations here in Honduras. After an excellent lunch we loaded a pickup truck with our gear and the Ready Relief Box and were on our way to GB’s main compound. 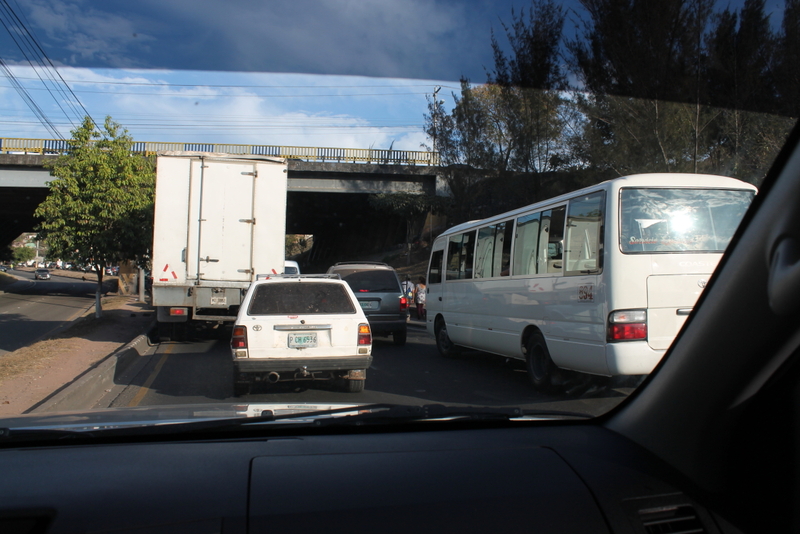 It’s supposed to take an hour, but thanks to the hustle and bustle and jam packed streets of Tegucigalpa, it took quite a bit longer. The place we were heading is a compound called Rapaco. It was worth the traffic hassles. 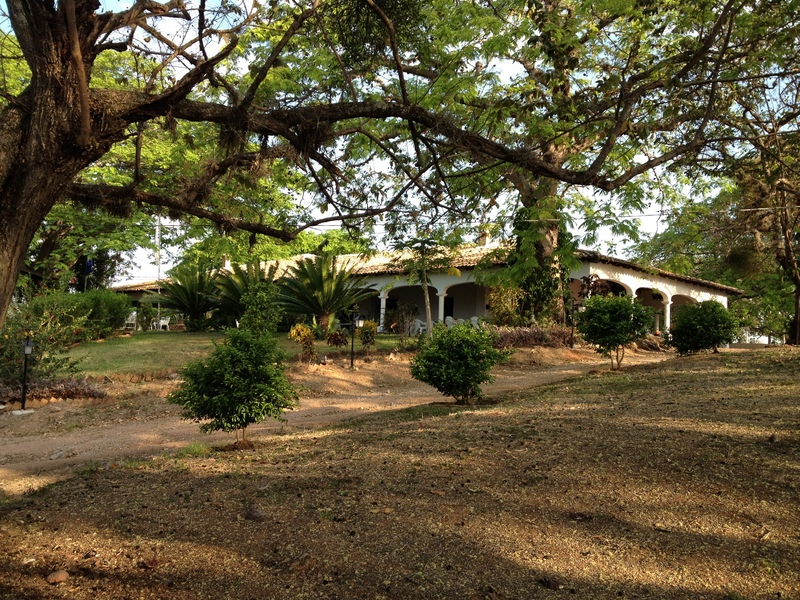 It’s an old ranch, or hacienda, out in the country about a hour’s drive east of the city. There we tucked into some amazing food and then tucked in for the night. We needed the good night’s rest, for the next day was another adventure. We’re awaiting the arrival of GB’s Medical Brigades. 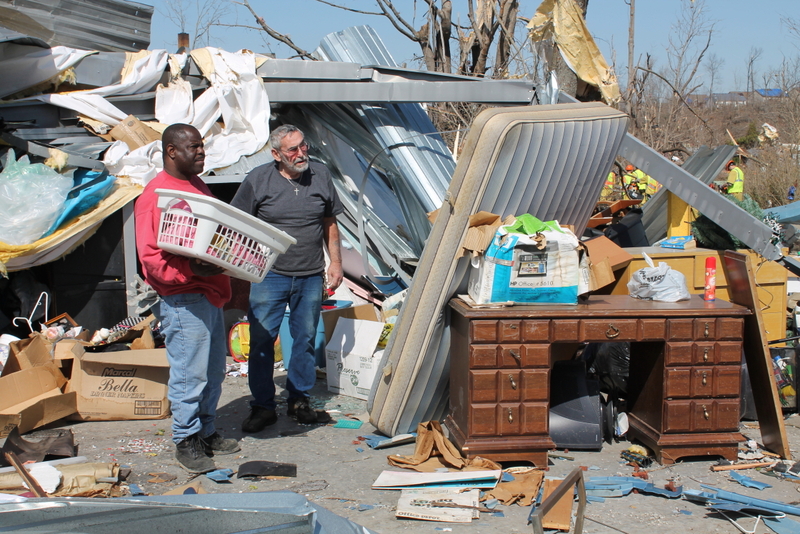 A handful will arrive this week and they’ll be using the Ready Relief Boxes. 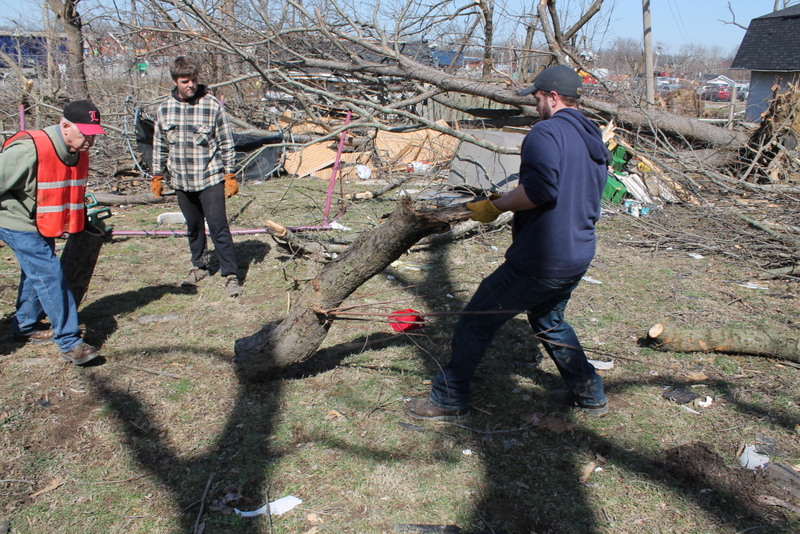 So we took a tour Saturday and visited some communities to check out Global Brigade’s other field operations. 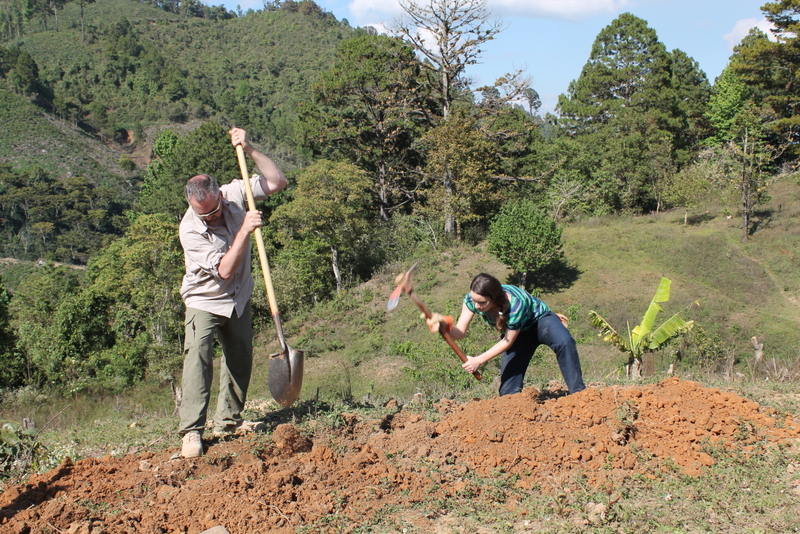 We took in clinics, met with community health providers, hiked up and down a mountain, and got our hands dirty digging a water pipe trench. 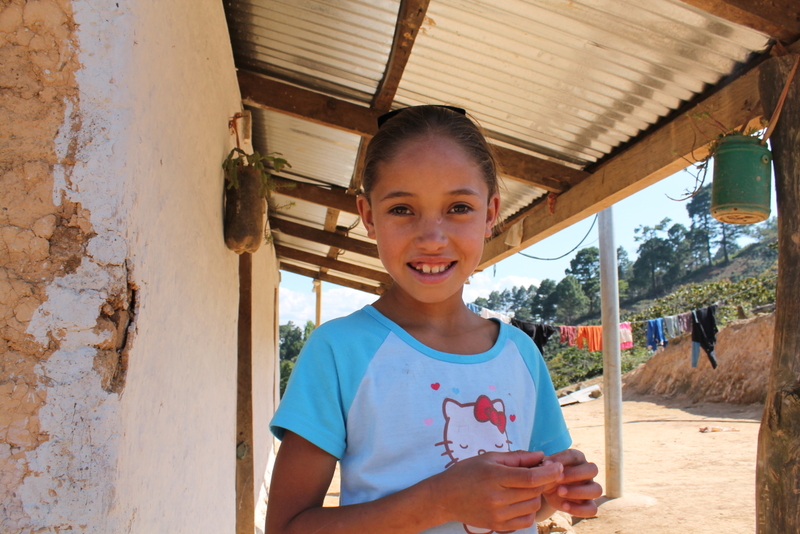 In a few short hours, Heart to Heart is off to Honduras! The adventure begins! Global Brigades is the world’s largest student-led global health and sustainable development organization. 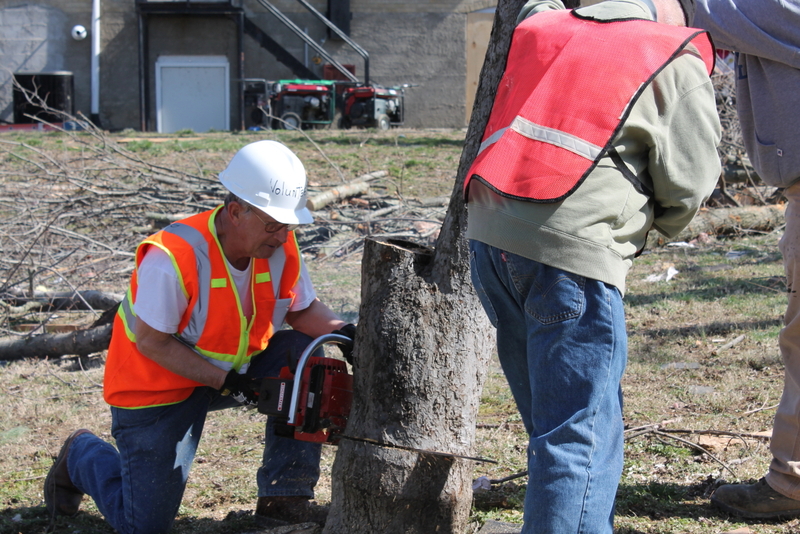 They are involved in projects around the globe, using their talents, energy, can-do attitude and volunteer spirit to work toward improving the quality of life in under-resourced communities. 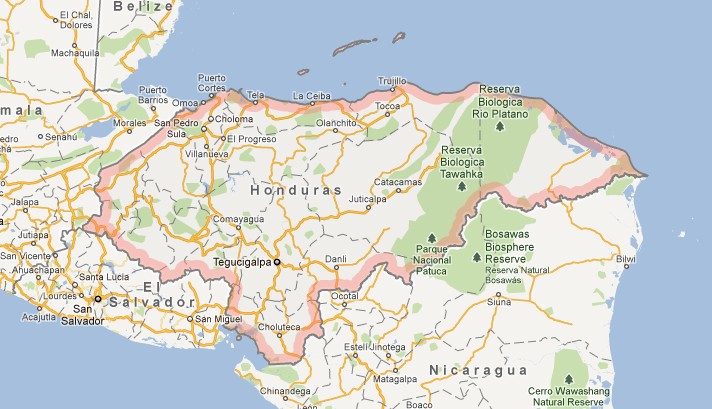 We’ll be joining several of GB’s Medical Brigades for a week’s time as they work in several clinics in Honduras. 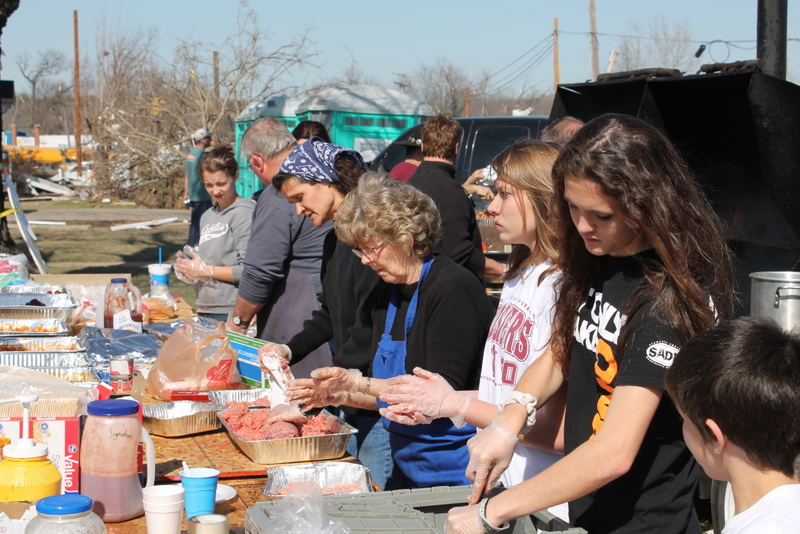 We’ll see the students in action and watch how they put HHI’s Ready Relief Boxes to good use. So follow our in-country adventures here on this blog, on our Facebook Page and on our Twitter feed. We expect to have some great stories to tell and some great photos to share. That is, if we have a good internet connection! 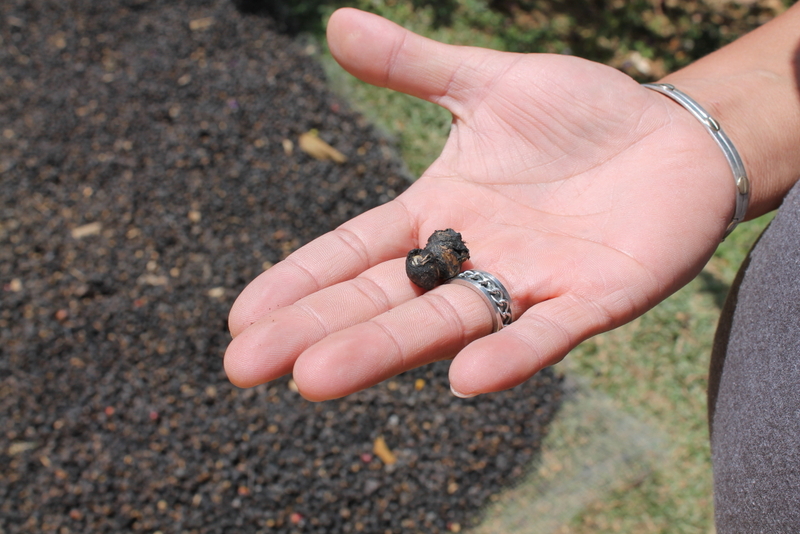 While issues plaguing east-central Africa have become a recent hot topic on social media, Heart to Heart International has long been aware of the needs, and has worked, in that part of the world. 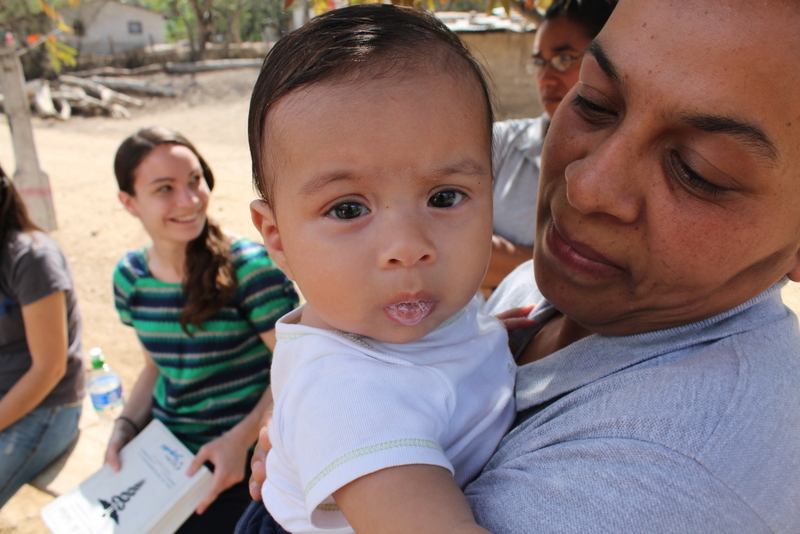 So has one of our great partners, the International Medical Corps (IMC). Heart to Heart is currently working with IMC to provide more than one ton of humanitarian medical aid and supplies to support IMC’s continuing efforts in one of the most troubled areas on the globe. 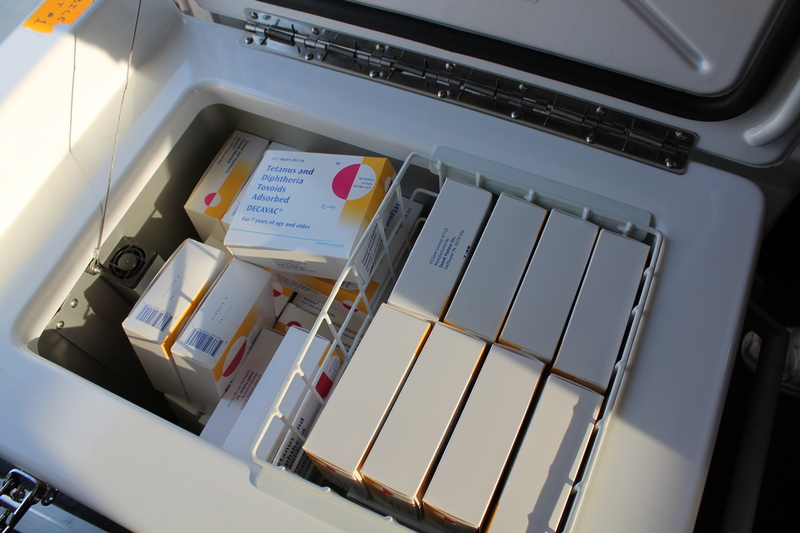 That is a lot of needed medicine for an initial shipment! 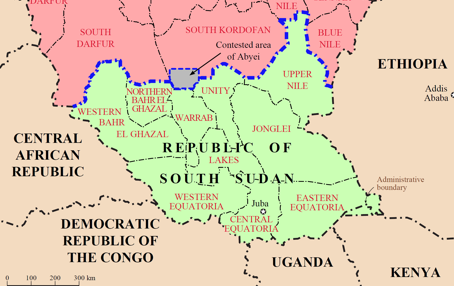 Here is a brief, even simplistic, synopsis of what is happening in the region: South Sudan is a new country. It gained independence in July 2011 following a half-century of warfare between the North and the South, and between and involving many other groups. This created vast numbers of refugees. Independence has also brought about a large number of ‘returnees’, people moving into South Sudan. Renewed and continued fighting, political/economic issues, border clashes, along with large populations on the move… all of this has created an environment where people are in need. 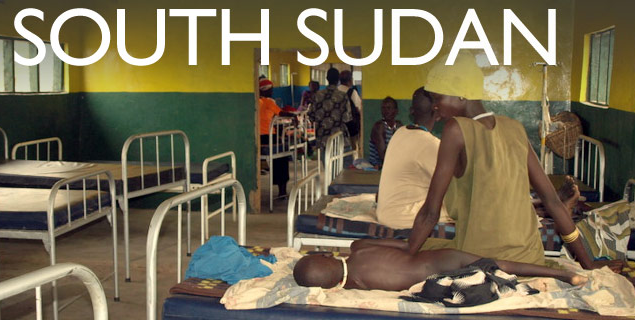 The International Medical Corps has operated in Sudan & now South Sudan for years and is currently serving hundreds of thousands of refugees, returnees and other vulnerable populations in both rural and urban areas, working to improve not just primary medical care, but long-term health as well. We here at Heart to Heart are proud to partner with such a fine group that mirrors our own mission to improve global health. 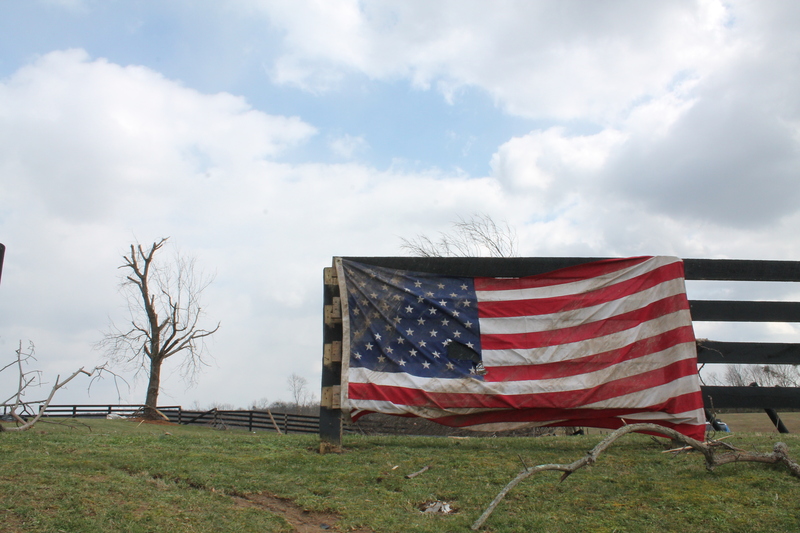 These photos from Henryville were taken during Heart to Heart’s nearly week-long operation in southern Indiana providing medical aid with our Mobile Medical Unit and distributing Care Kits to residents in the region. 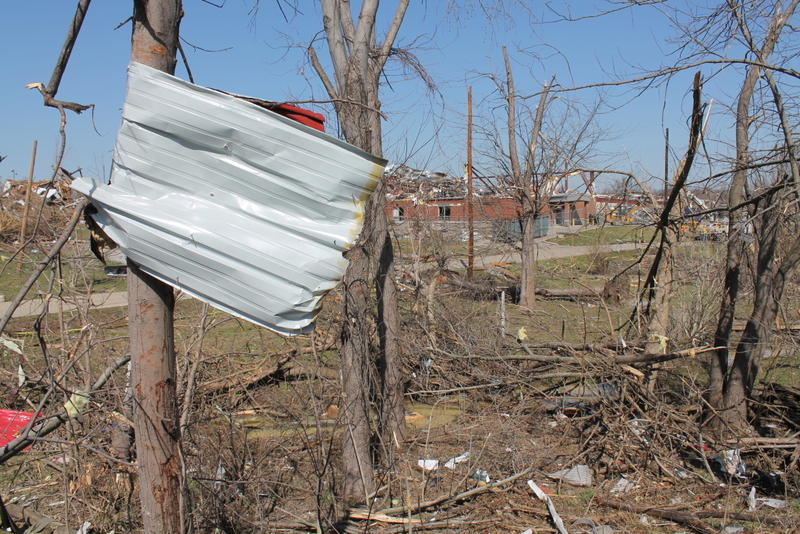 The images are from downtown where the tornado did the most harm. 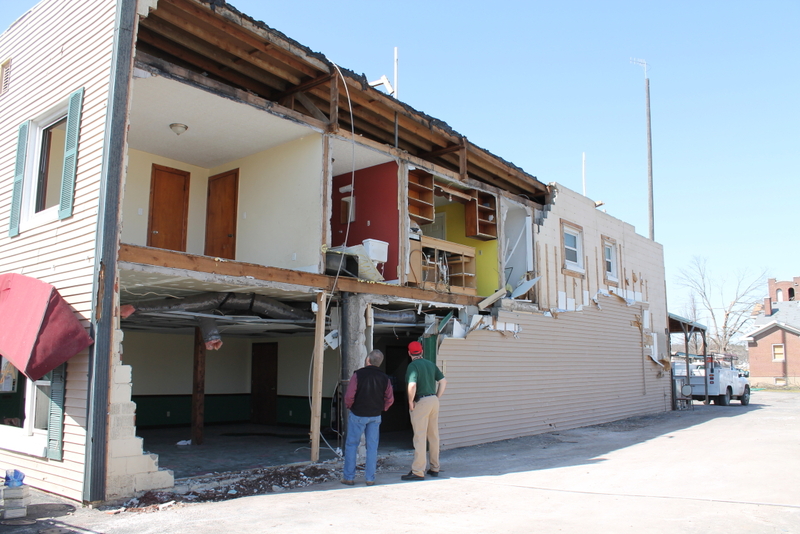 The damage was great, but the restoration is well underway due to the resolve of the local community. 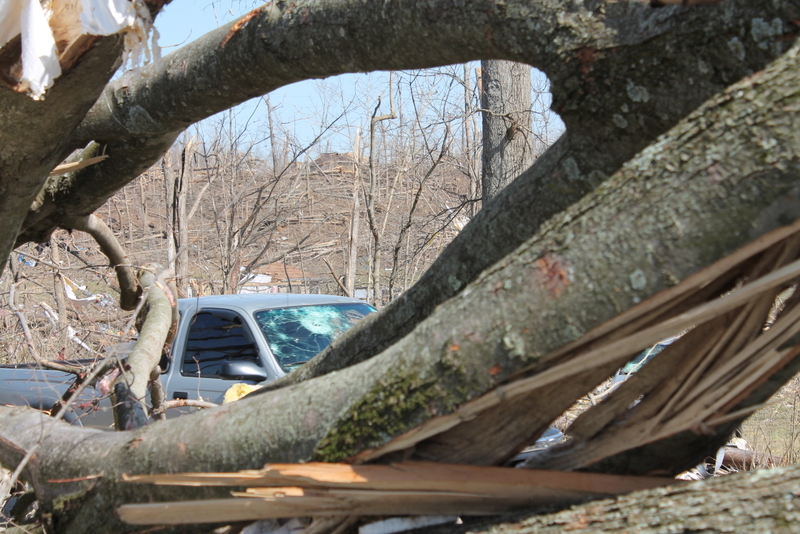 And we at Heart to Heart want to thank the residents of Henryville and surrounding communities for letting us serve. 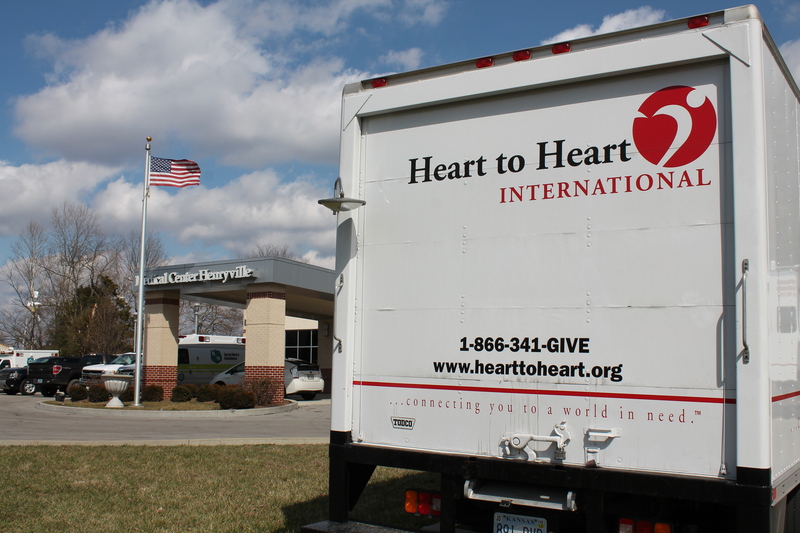 Another day has passed for Heart to Heart on the ground in Henryville, Indiana and we saw more people seek out medical aid from the Mobile Medical Unit. 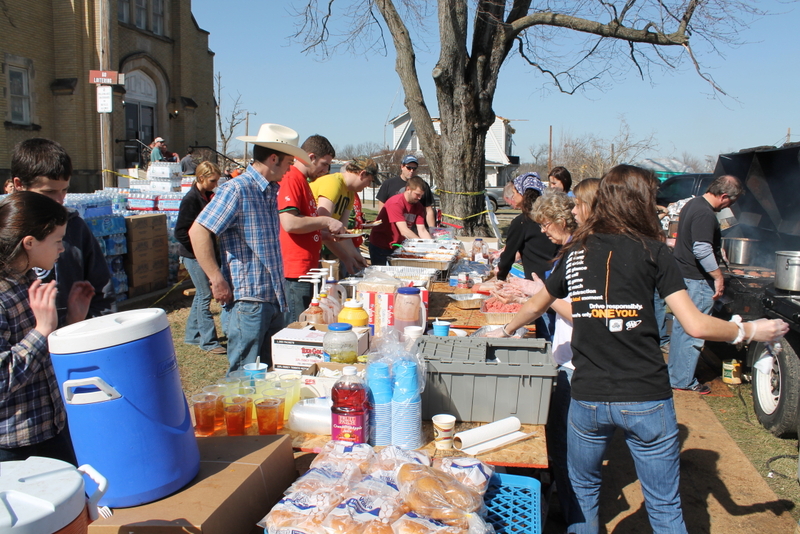 The MMU has become the town’s First Aid Station where residents and responders and volunteers come for a variety of medical needs and mostly they come for a tetanus shot. 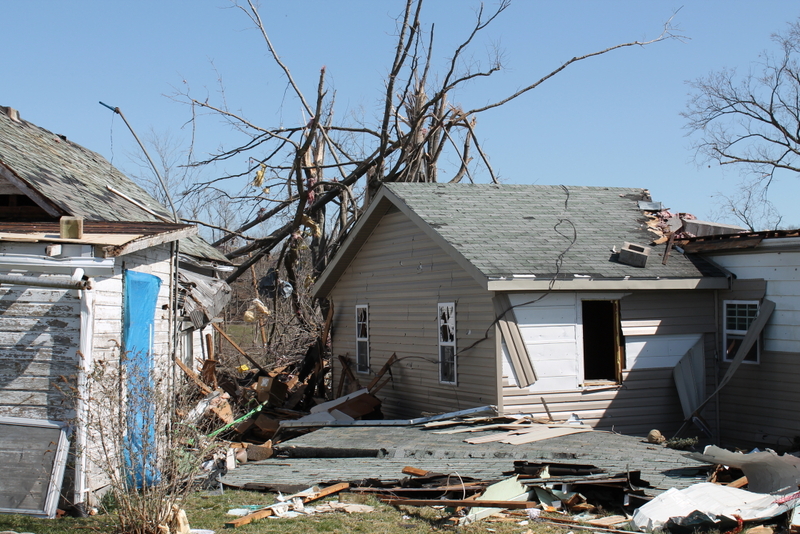 The doses were provided by the Joplin Community Clinic as a way to pay it forward from one town that suffered much to another. And the generosity has impressed many in this small southern Indiana town. One young man named Justin stopped by for a vaccination. 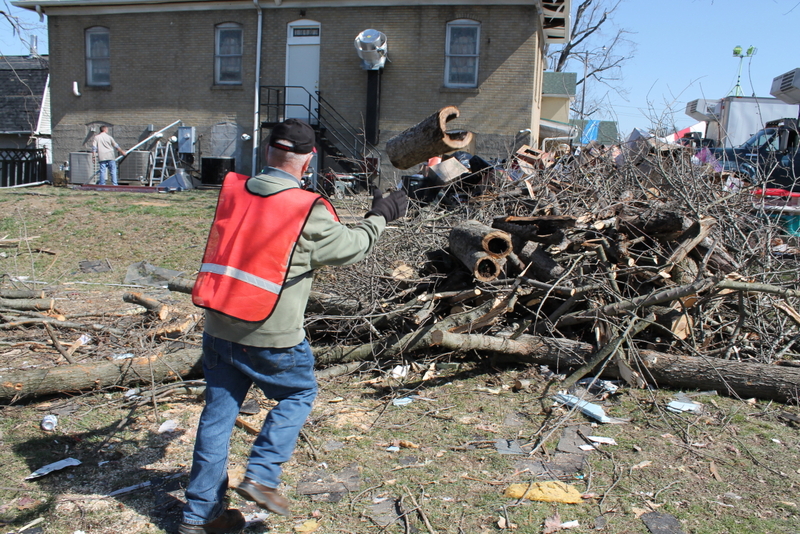 He was off to assist his neighbors clean up and wanted to be protected in case he suffered a cut or stepped on the many nails and screws amongst the debris. 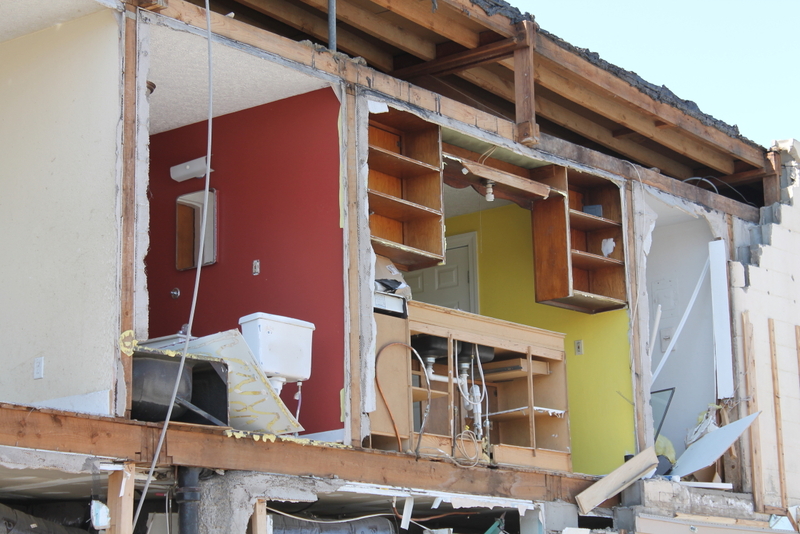 Astonishingly, his home was knocked off the foundation and ripped in half, yet he was out helping his neighbors first, because he said, they were worse off. 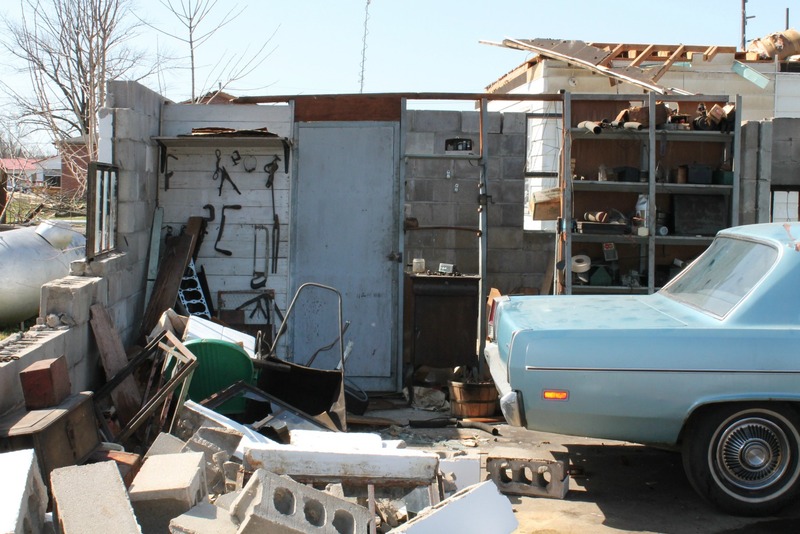 There are several people whose homes are in dire shape, or simply do not exist as any type of home at all. 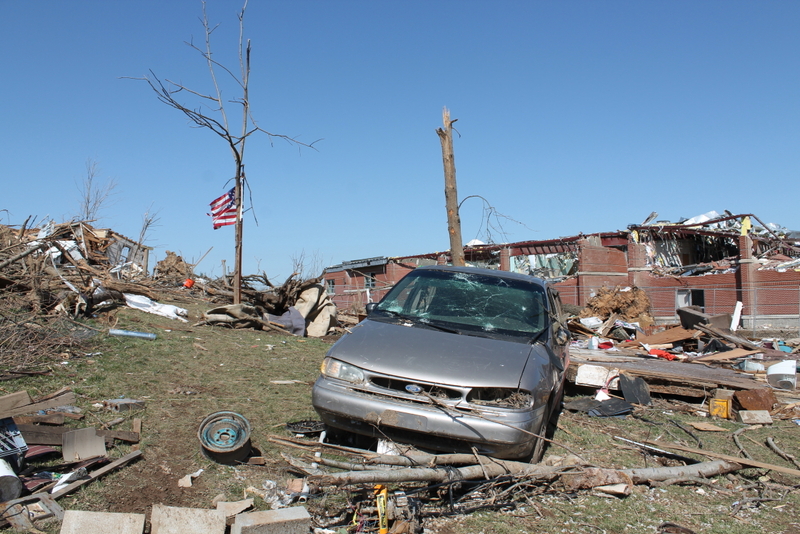 I took some time to walk though the center of town, documenting the damage. 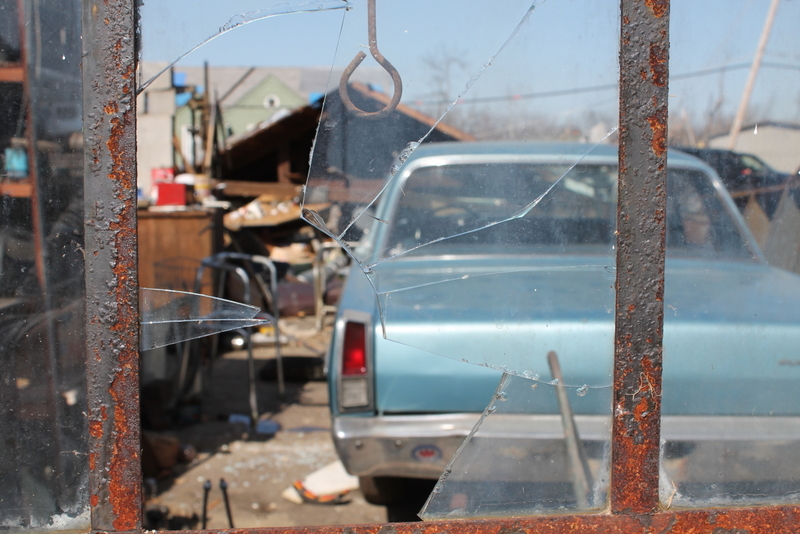 What I saw, beyond the ruined houses, was a beehive of activity. Residents sifted through broken belongings, volunteers chopped down broken trees and did myriad jobs. There is so much to be done. 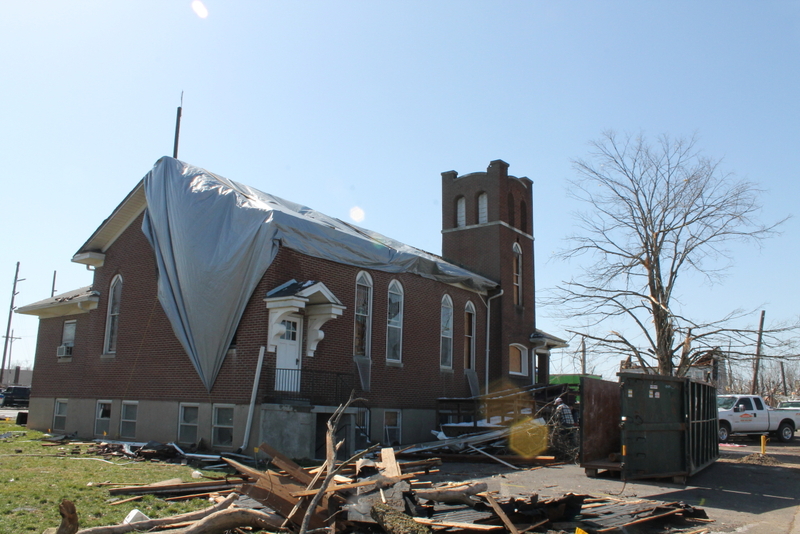 We’ll have more photos and info from Heart to Heart’s efforts in Henryville soon. 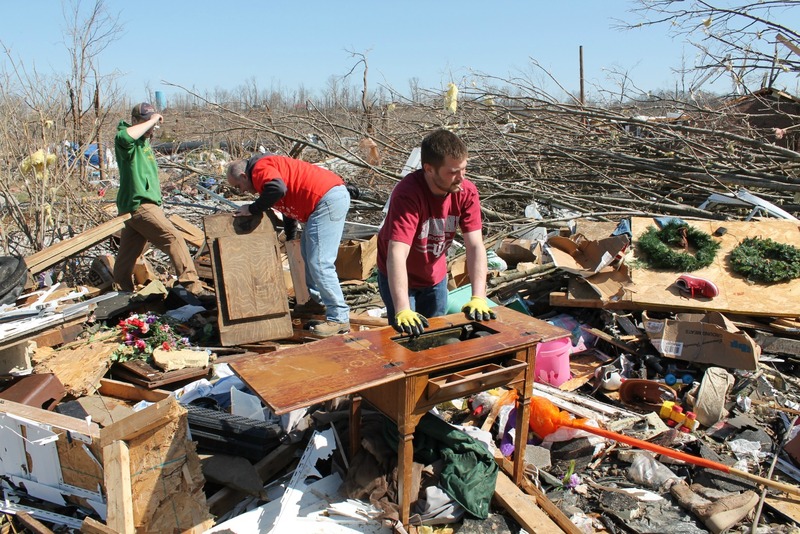 Plus ways you can continue to support tornado relief around the country. 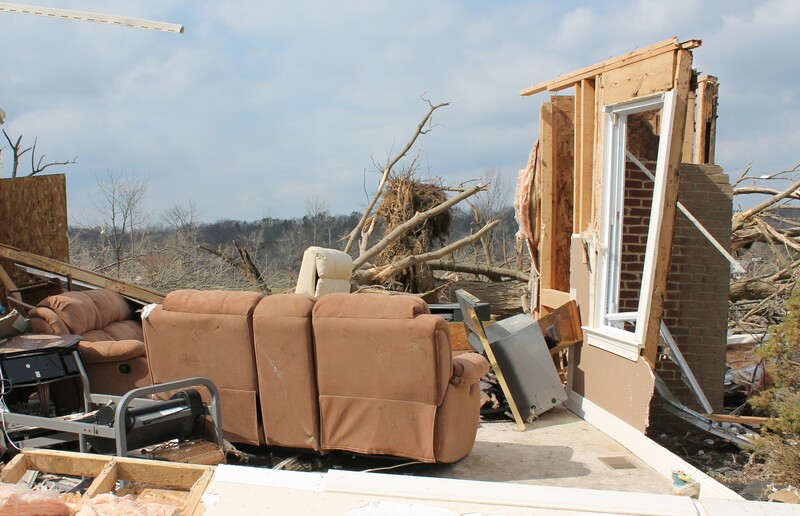 Want to update everyone on the happenings with Heart to Heart International and our disaster response in Henryville, Indiana. 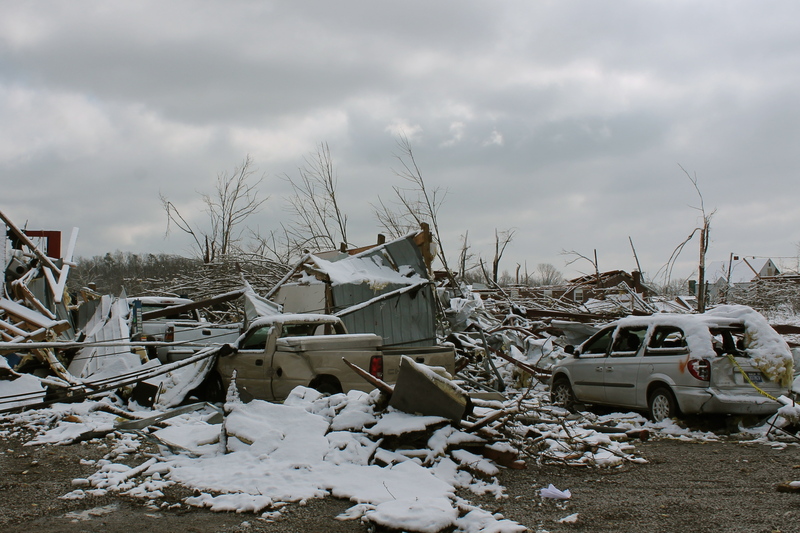 It’s Monday afternoon, three days since we arrived on site, three and a half days after the EF-4 tornado tore through this southern Indiana town, not too far north of Louisville, KY.
We had snow overnight, a couple of inches. 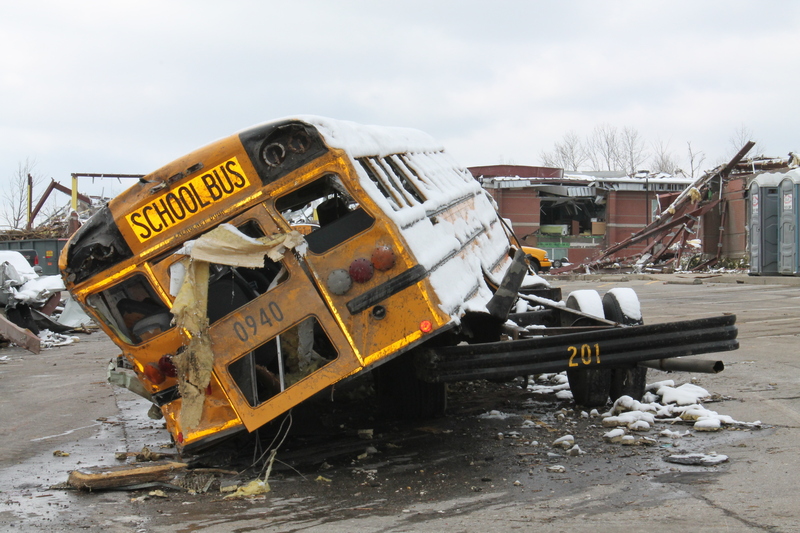 Thick wet snow that blanketed these communities, softening the jagged wreckage of the town if only for a while. 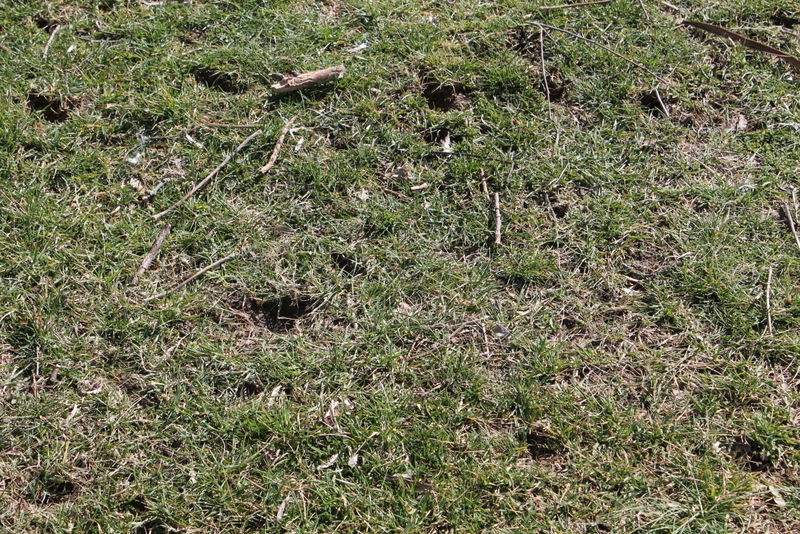 There is damage here, plenty of it. 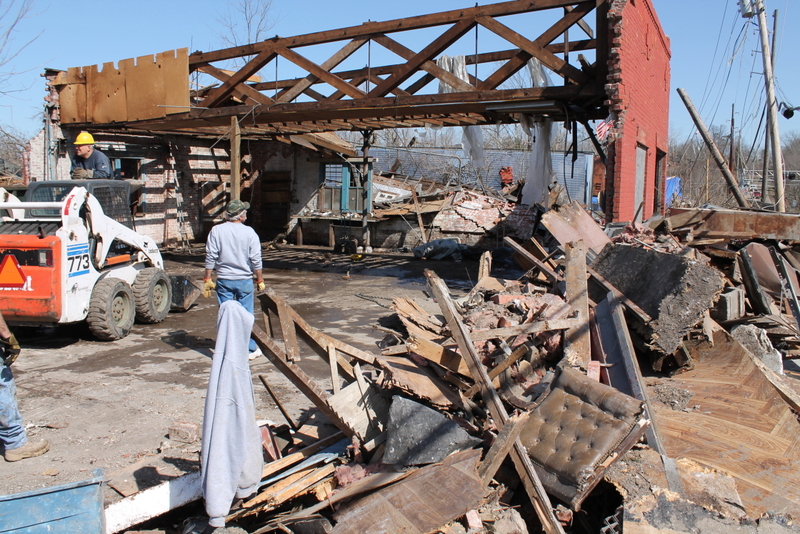 I was asked by a television crew for Indiana Public Media how this disaster ranks compared to others. I told them it doesn’t compare, not for the people who live here. For them, this is the big one. 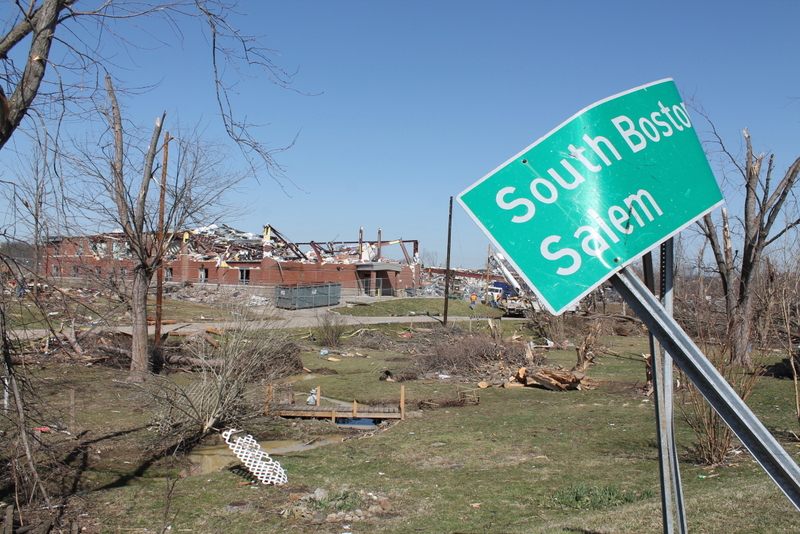 This is their Joplin, their Alabama, their Katrina. 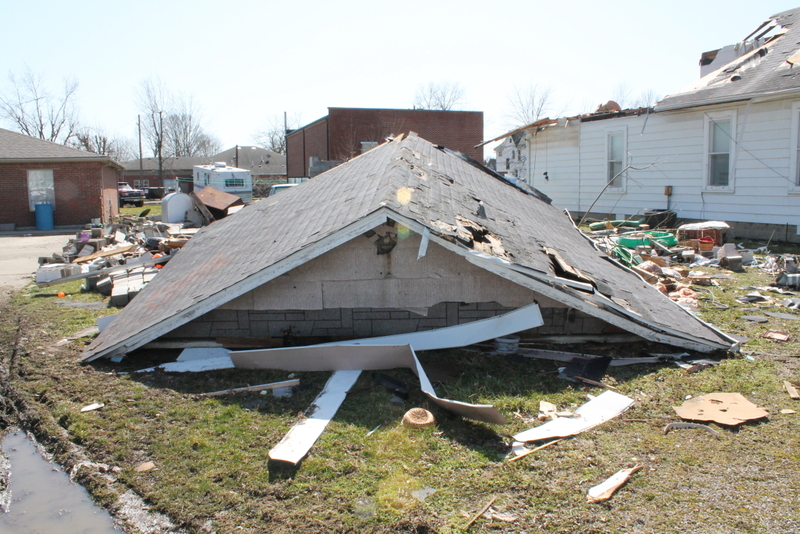 This is their Henryville. This is their Marysville. 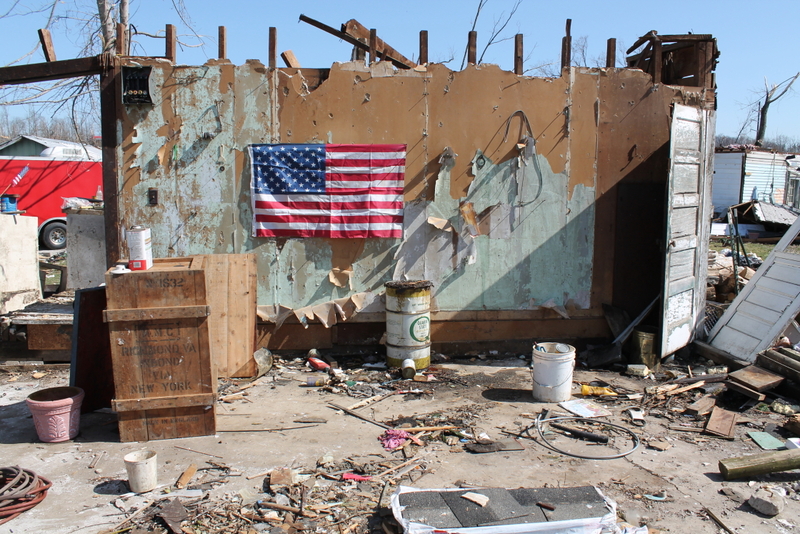 We at Heart to Heart are honored to be part of the relief effort. Our Mobile Medical Unit is serving as Henryville’s only first aid station, medical clinic and vaccine dispensary all rolled into one. A Nurse Practitioner and nurses from the Clark County Health Department are staffing our unit, treating residents for a variety of ailments. 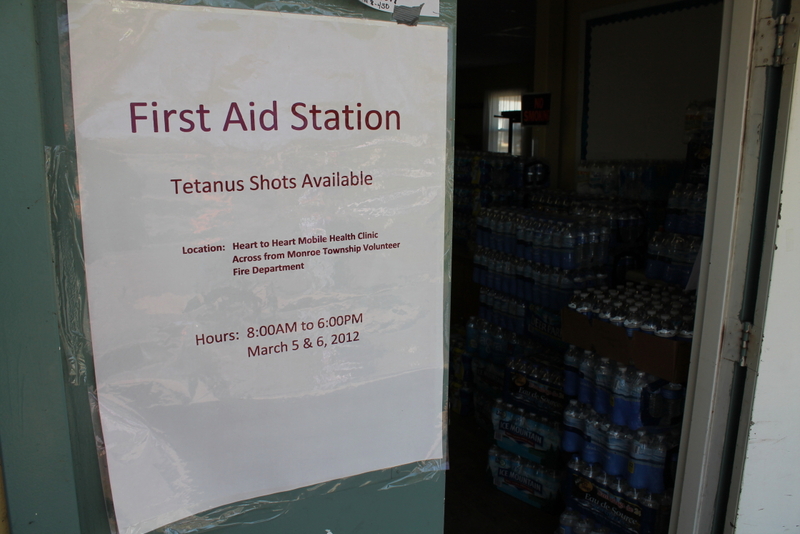 What is helping tremendously are 400 doses of Tetanus vaccine HHI volunteers brought in Sunday afternoon. 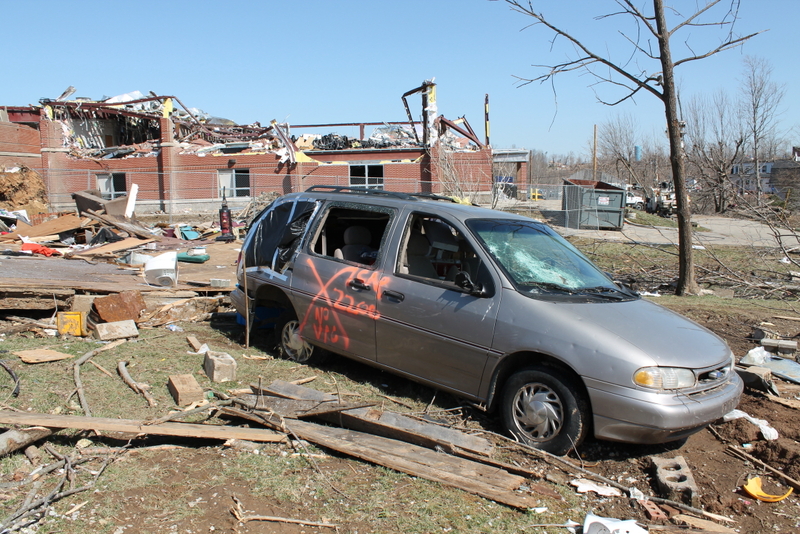 The vaccine comes from the Joplin Community Clinic. Talk about Paying It Forward!! 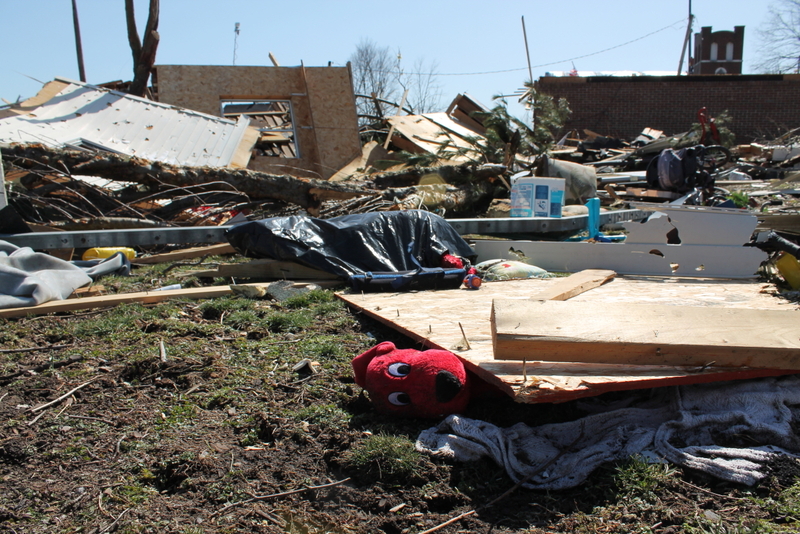 And we’ve also been delivering Care Kits and water to surrounding shelters and communities. 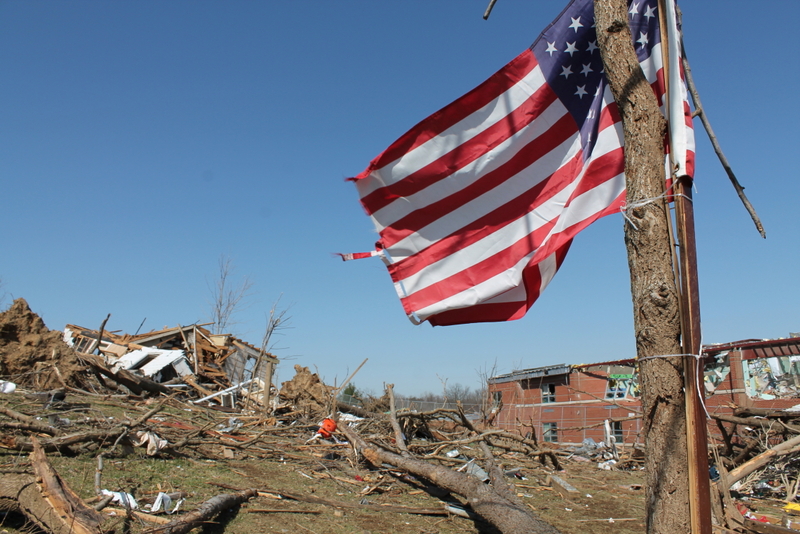 The volunteer spirit is alive and thriving in southern Indiana and you sense resilience in the air despite what has happened. 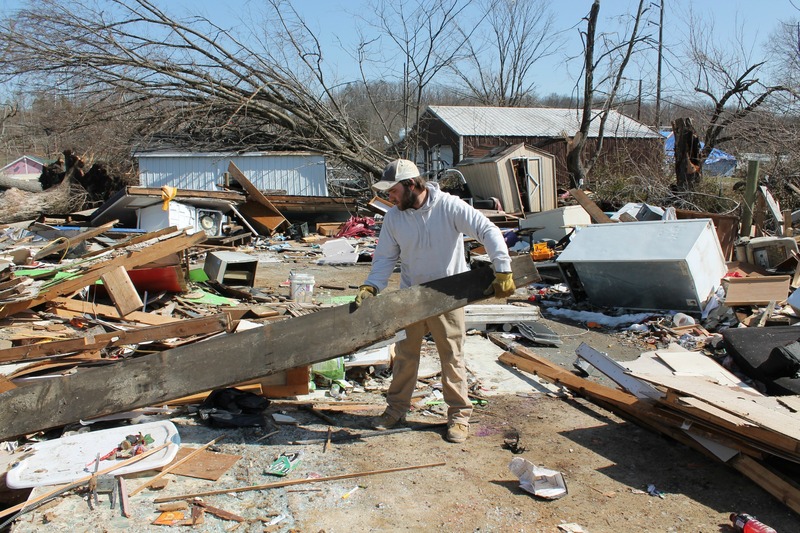 Heart to Heart International committed to responding in the minutes following news that a devastating tornado had just ripped through communities in southern Indiana during the widespread tornado outbreak March 2, 2012. 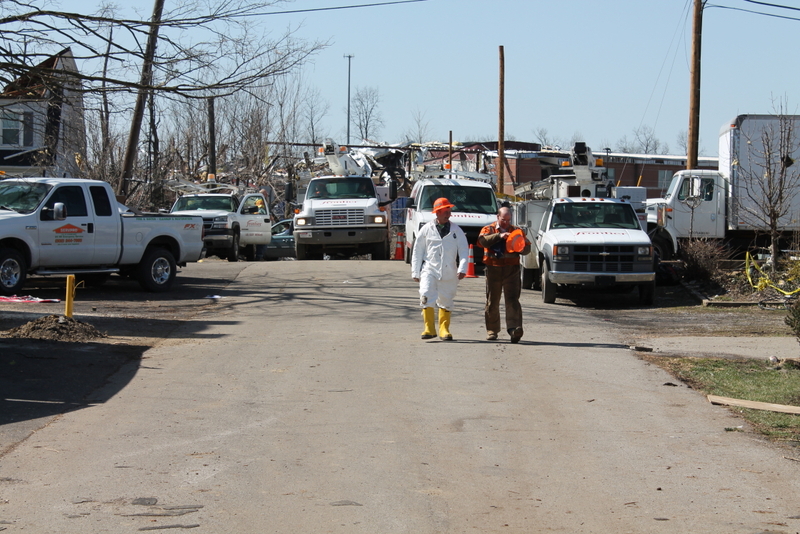 An Advance Team mobilized and hit the road, arriving in Henryville, Indiana as the shock of what had happened a few hours before was still very fresh and visible. The Advance Team came, not just to assess, but ready to deliver aid in the form of Care Kits, water and medical supplies. 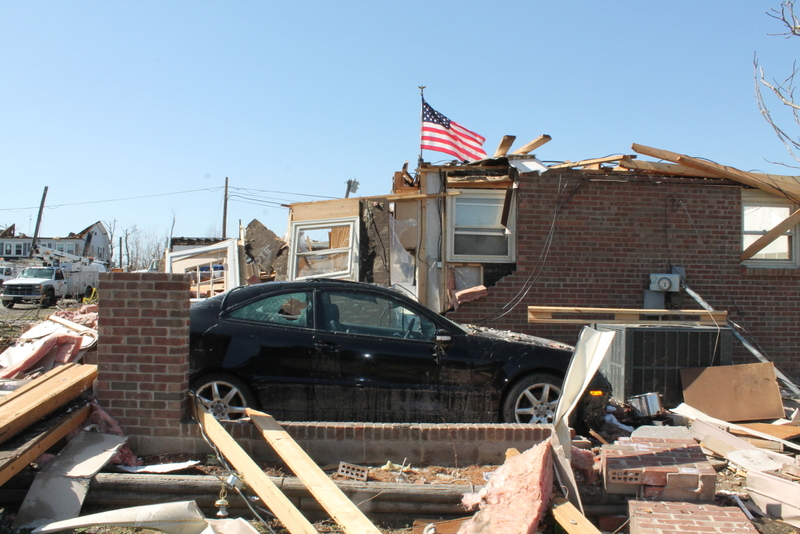 The town’s only medical center was put out of commission by the tornado, so Heart to Heart’s rolling emergency room, the Mobile Medical Unit, will now serve temporarily as the town’s only hospital. 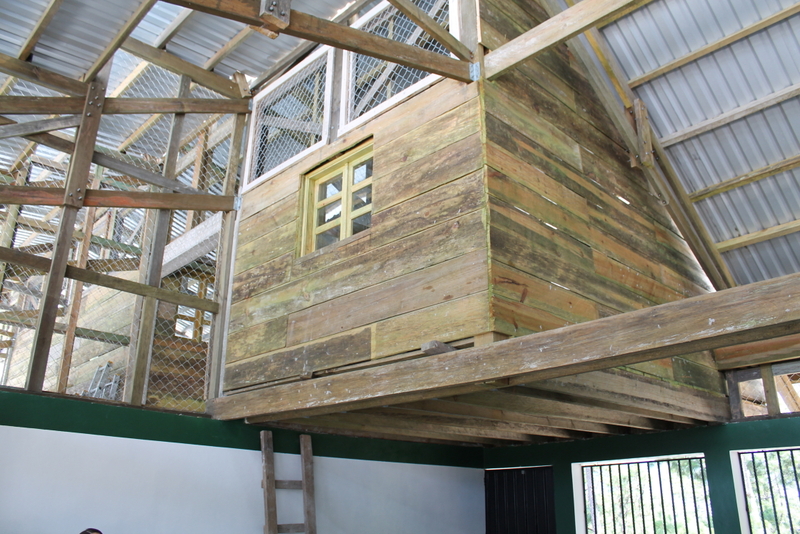 We have partnered with the local healthcare system and volunteer medical personnel will staff the MMU. There is plenty of work to be done in the coming days. Work that is made possible by you. 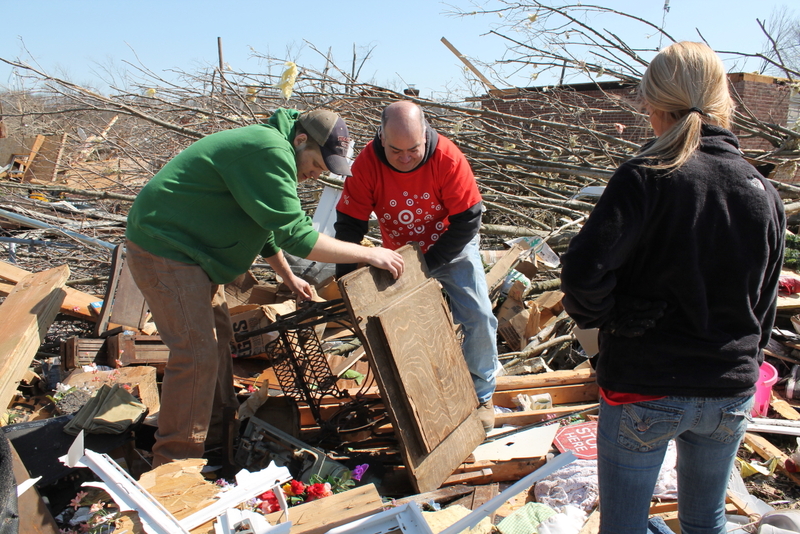 We need groups to assemble Care Kits as part of our healthcare response.